President Black called the March 25, 2019 Regular Meeting of the Board of Commissioners to order at 7:00 pm followed by a prayer and the Pledge of Allegiance. He announced that Proof of Publication was available for review. Commissioner HOLTZMAN moved to approve the minutes from the March 11, 2019 Regular meeting of the Board of Commissioners. Commissioner SCHIN seconded the motion. Motion carried 5-0. President Black presented a letter of Commendation to Julie Echterling in recognition of her 2500 hours of service to Lower Allen Township. She is currently serving as a Compliance Specialist within the Police Department and has served in several other capacities for various departments. President Black presented a letter of Commendation to Kenneth Hivner in recognition of his 15 years of service to the Emergency Medical Services Department of Lower Allen Township. He is currently serving as an EMT Supervisor. Resolution 2019-R-06, proclaiming the month of April 2019 as “Pennsylvania 811 Safe Digging” Month. Commissioner SCHIN moved to approve the Consent Agenda, and Vice President SIMPSON seconded the motion. Motion carried 5-0. Commissioner HOLTZMAN moved to approve the Check Register of March 15, 2019 in the amount of $802,279.49 and Commissioner SCHIN seconded it. Motion carried 5-0. Commissioner SCHIN moved to enact Ordinance 2019-01, authorizing the acquisition of lands owned by Asbury Atlantic, Inc., by the use of eminent domain for drainage and other transportation purposes. Discussion ensued regarding the basis of this decision. A transportation easement across parcel 13-09-0545-006, was dedicated by Bethany Village to Lower Allen Township in 2004. Additional transportation easement, plus drainage and temporary construction easements are necessary. Flooding issues and runoff from Gettysburg Road have caused severe problems leading to the decision to relocate a section of Gettysburg Road. Currently, road crews are working on the road daily to keep it open as anything causing road closure results in a major traffic disruption. Temporary Construction Easement areas will be leased during the construction project and then returned. Ordinance 2019-01 was approved by a 5-0 vote. Vice President SIMPSON moved to adopt Resolution 2019-R-07, authorizing the Township President to sign all documents necessary for the acquisition of lands owned by Asbury Atlantic, Inc., by the use of eminent domain or other means for drainage and transportation purposes. Commissioner VILLONE seconded the motion. Motion carried 5-0. Commissioner HOLTZMAN moved to adopt Resolution 2019-R-08, appointing Bryan R. Harshbarger to the position of Public Works Coordinator in the Public Works Department effective April 26, 2019. Commissioner SCHIN seconded the motion and the motion carried 5-0. Commissioner SCHIN moved to approve the appointment of Vicky Ann Trimmer of the firm Daley, Zucker, Meilton,& Miner, LLC, as Alternate Township Solicitor, effective immediately. Vice President SIMPSON seconded the motion and the motion carried 5-0. Mr. Richard Bonneville, 1320 Brewster Court, wished to address the Board tonight regarding issues with the Norfolk Southern Railroad. He stated that the railroad crossing at St Johns Road was closed for over an hour today due to trains on the track, not construction. He questioned if there is a time limit for how long they can stop traffic. President Black suggested that the Township could look into the rules of how long a railroad crossing can be closed to traffic and see if we have grounds for a complaint. Then the Township Manager may be able to write a letter to the Pennsylvania Utilities Commission to address recent problems with Norfolk Southern Railroad. Mr. Dan Flint, Township Engineer, explained that this plan for Donald L. Jr. and Tena Brown would allow for subdivision of the vacant 1.418 acre lot at this location. Half of the divided parcel would be added to each of the adjacent lots to the left and right of the parcel. Commissioner VILLONE moved to approve SLD Docket No. 2019-04 and Vice President SIMPSON seconded the motion. Motion carried 5-0. Commissioner SCHIN moved to approve this resolution which authorizes the Township Manager to sign Amendment No. 1 to PennDOT Reimbursement Agreement No. R180080002, for the Gettysburg Road relocation project. Commissioner HOLTZMAN seconded the motion and the motion carried 5-0. Mr. Flint stated that PennDOT has issued the permit for construction of the roundabout and Charter Homes is working on it. The hope is that construction can begin as soon as the school year ends. The Township is the applicant and recipient of the PennDOT grant for the roundabout but construction will be put out for bid. Vice President SIMPSON moved to authorized advertisement and Commissioner SCHIN seconded the motion. Motion carried 5-0. 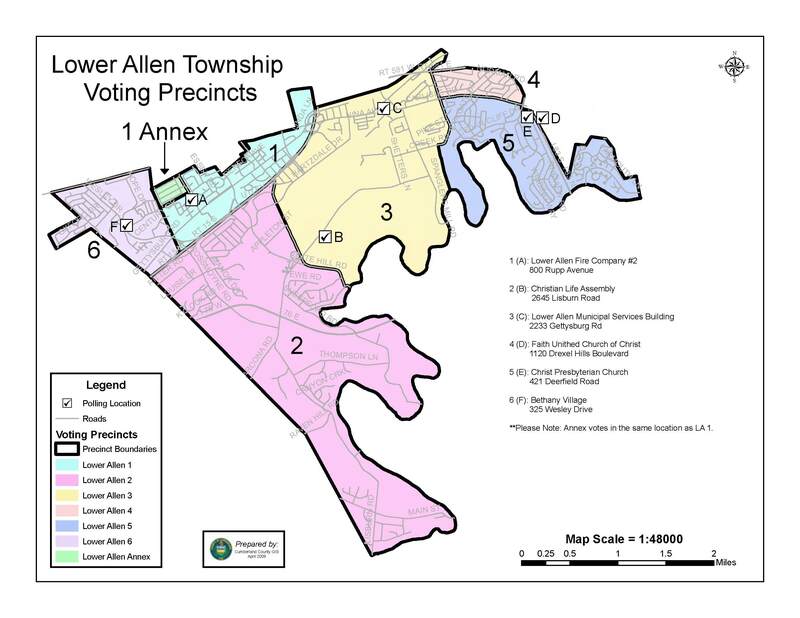 Ms. Erin Trone reported that a public hearing was held on February 21, 2019 to consider Docket #2018-09, a special exception in accordance with Section 220-165B of the Code of Lower Allen Township. It was found that Youssef Youssef of 1710 Carlisle Road, Camp Hill, had successfully addressed concerns of the Zoning Board for establishing a tailor shop with a 6 square foot sign. The approval was granted on March 21, 2019. 5 out of 5 Commissioners voted to restrict standard buses from parking for any amount of time on the street in Residential zones. 4 of 5 Commissioners thought that short buses should be restricted from parking for any amount of time on the street in Residential zones. The majority of Commissioners thought that mini-buses, micro-buses, micro-coaches and high-capacity vans were permissible for street parking in Residential zones. 5 out of 5 Commissioners voted to restrict standard buses from parking in driveways in Residential Zones. 3 of 5 Commissioners thought that short buses were permissible to be parked in driveways in Residential zones for an unlimited amount of time. The majority of Commissioners thought that mini-buses, micro-buses, micro-coaches and high-capacity vans were permissible for driveway in Residential zones. In summary, standard length buses (45 ft) are not to be parked in residential neighborhoods at any time. Short buses (22 ft) are not to be parked on the street at any time but may be parked in driveways for an unlimited amount of time. Chapter 209.29 shall be amended to define buses and what their parking restrictions are. Mr. Vernau spoke about his research into live streaming public meetings. There would be some hardware that the Township would need to purchase including camera(s), new computer, and an encoding device, plus a carrier service for the video. If captioning is required, that is an additional cost. He has a proposal from a commercial vendor named Swagit, offering varying levels of service based on price. Minimal charge for hardware, licenses, setup, and support services would be $3,290.00 and $9,000 for a yearly managed service package. Mr. Vernau also spoke with Mike Riazy from 3rd Element Consulting. Their proposed hardware and setup costs would be approximately $5,000 to $5,500. The platform used to stream the meetings could include free sites such as Facebook or YouTube as well as paid sites such as UStream, Livestream.com, Boxcast, or Muniweb. This could add an additional $1,500 annually, with a total estimate running around $5,000 to $6,700. interested in moving forward with livestreaming. Ms. Trimmer will look into any legal requirements on captioning before the proposal is officially presented to the Board. Finance Director Rick Grove stated that the Finance Department has finished printing the quarterly refuse and sewer bills, and the stormwater fee will be included with this billing for the first time. Vice President Simpson mentioned a letter received from Hamden Township stating that they are not going to be participating in Crimewatch. They have created their own system which is sent out to subscribers. Mr. Holl replied that we went live with the Crimewatch program last Tuesday, putting out misdemeanors, felony arrests, and warrants. We received tips on two warrants almost immediately. He stated that Crimewatch also has a broadcasting function as well as a recall function. The County is still discussing paying toward the cost of Crimewatch via the County Chiefs Association. It provides a valuable outreach to the community and provides information that can keep people safe. Posts to Crimewatch must be approved by administration. When someone is arrested, Sergeant Foltz or Lieutenant Thomas adds the narrative. Commissioner Schin spoke about attending a recent COG meeting where AT&T was present and FirstNet was discussed. Additional towers are being added to improve speed. Mr. Holl stated that we subscribe to FirstNet. He also spoke about the COG auction, which is always held at Good Hope Elementary School, being moved to Good Hope Middle School. Large items such as cars are encouraged. There is a 90% return to the municipalities. Mr. Schin questioned if motorized bikes are allowed on the road. He was told that it depends on how much power the engine has. He also mentioned a dip in the road on Lisburn Road just past the prison where some pipe work was done and road closed signs left turned over by the railroad. Mr. Schin also spoke about the $18,000 charge to disconnect the HVAC system to the BonTon building. Mrs. Trone stated that this was the lowest bid. He has conflicts with some of the Public Safety Committee meetings and Mr. Simpson will take his place. Mr. Holl stated that the first Public Safety meeting has been advertised for April 1st. It will be an organizational meeting, where availability is discussed, and meeting dates can be adjusted. Mrs. Trone stated that the Development Authority will be meeting this Thursday regarding an offer they received for purchase of the Yetter Court property. 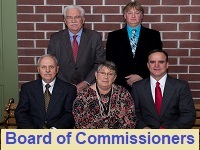 The Regular Meeting of the Board of Commissioners adjourned to Executive Session at 8:17 p.m.